My fellow writer-blogger, Laurel posted this provocative photograph on her blog today. Along with the image she included a few paragraphs of her fiction writing. I believe the scene she posted is related to the bigger writing project she is working on. And this is one of the first times I've seen my friend publicly reveal this aspect of her writing life. We haven't talked about the post yet, but my guess is that this was one of those things that felt BIG, as in risky and wild and vulnerable and brave. The scene she wrote is vivid and compelling. I highly recommend the two-minute treat of reading it. If she and I don't meet up sooner, we'll talk about her post on our next Sunday morning jog. 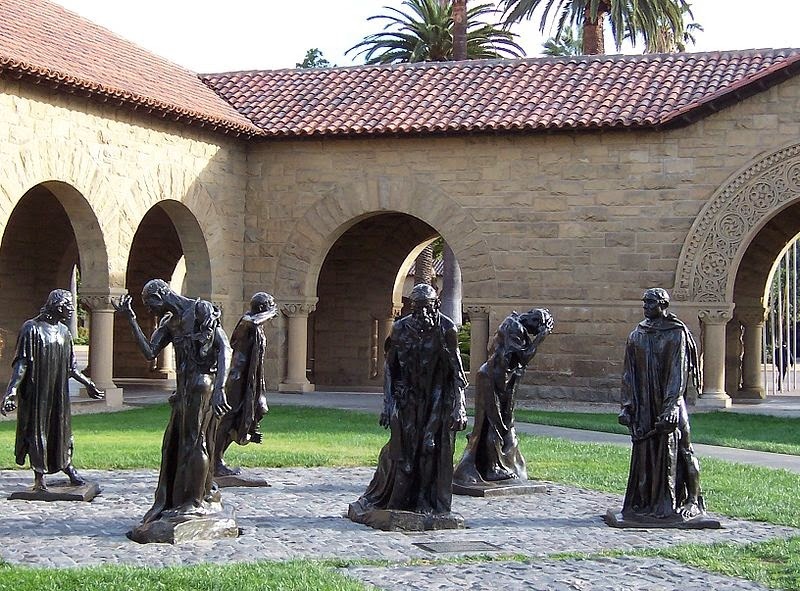 For about two years now, it's been our habit to meet halfway between her house and mine and then to run to the The Burghers of Calais, in the main Quad at Stanford. When we arrive at the sculptures, we each tap the figure that has become "our guy" (Mine is figure on the far right). Inevitably during our jogs, about five blocks from campus, both of us feel like we want to stop running, but getting to that tap keeps us going--it marks a clean finish that is within our ability, but slightly beyond our natural will, and over the course of two years, I'm sure the few extra blocks we run has added miles to our grand total. We started this habit of tapping the statue (which is now a compulsion, a kind of superstitious belief that bad luck will come if we don't make it to our final tap) when we were training for our half-marathon in 2012. At that point I don't think either of us had the conscious thought that we would become writers. We were both writing, but it feels safe to say that fear and practicality shrouded our intent. So we set our sights on 13.3 miles and started running. We built a habit, we discovered that our relationship thrived in the context of a shared goal, we kept running, and we celebrated when we hit our milestone. The running habit was good for us so we kept on running even after we finished training for the race. And still, we did not have in mind that we were writing together. But after the half-marathon, writing became our shared focus, and since that time our writing lives have changed. It's not that we are producing more volume (although we might be), but it's that we are putting more of ourselves into the process. We are writing like it is our life's work, even if that life's work is only celebrated between the two of us. This level of commitment feels like crossing that bridge in the mist in the photo. We have no idea where it is going, but we are invested to the point that we have no choice but to cross and find out what's on the other side. This is scary and good, and I believe it may be just the craziness that propels real artists. I never would have gotten to this point without a friend by my side--and not just any friend, but my friend, Laurel. My friend who has taught me about clean finishes, intelligent process, and precision. My friend who has been by my side taking one more step, encouraging me to take it to the finish line, to tap the statue. Every once in awhile we peer around and look at where we are, but it still feels too scary and bad-luckish to say that we are doing the one thing we most wanted to do, but were afraid to admit--which is to become writers. Instead, fueled by companionship and shared strengths, we satisfy ourselves by taking the next step. Thank you for all the encouragement and inspiration. And for sharing a tiny bit of your fiction today. These two quotes popped into my head after reading your blog today. "The great affair, the love affair with life, is to live as variously as possible, to groom one's curiosity like a high-spirited thorough-bred, climb aboard, and gallop over the thick sun-struck hills everyday. Where there is no risk, the emotional terrain is flat and unyielding, and despite all its dimensions, valleys, pinnacles, and detours, life will seem to none of its magnificent geography, only a length. It began in mystery, and it will end in mystery, but what a savage and beautiful country lies in between." "I wrote the last sentence of The Patron Saint of Liars in early April and stumbled out of my apartment and into the beautiful spring feeling panicked and amazed. There is no single experience in my life as a writer to match that moment, the blue of the sky and the breeze drifting in from the bay. I had done the thing I had always wanted to do: I had written a book, all the way to the end. Even if it proved to be terrible, it was mine."